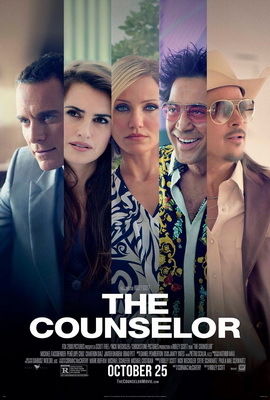 Halfway through this almost two-hour movie, the Counselor (Fassbender) asks Westray (Pitt): “What happens next?” A better question would have been: “What’s happened so far?” The answer to both: “It’s difficult to determine.” If you’ve seen the trailer and couldn’t figure out what the movie was about, watching the whole film won’t necessarily help. The cast is impressive, the screenwriter celebrated, the director experienced. But somehow, everything seems out of alignment. Dialog often straddles the border between poetry and platitudes; scenes lack cohesiveness; performances are missing an overall sense of purpose. Cormac McCarthy is an accomplished author. The Coen Brothers adapted his words to create “No Country for Old Men.” Here, McCarthy has written his first screenplay and not coherently. It’s difficult to believe that drug traffickers would ruminate so lyrically on the morality of choices and the existential meaning of death. Talky sequences don’t explain much. Choppy scenes don’t build suspense. There are way too many of both. The movie keeps stumbling onward, taking us someplace else. If this movie has something fresh to say about drug trafficking — or anything — it’s unclear whether it said it. It’s as if McCarthy put his story into a blender, pushed “Chop” and dumped the contents on the screen.